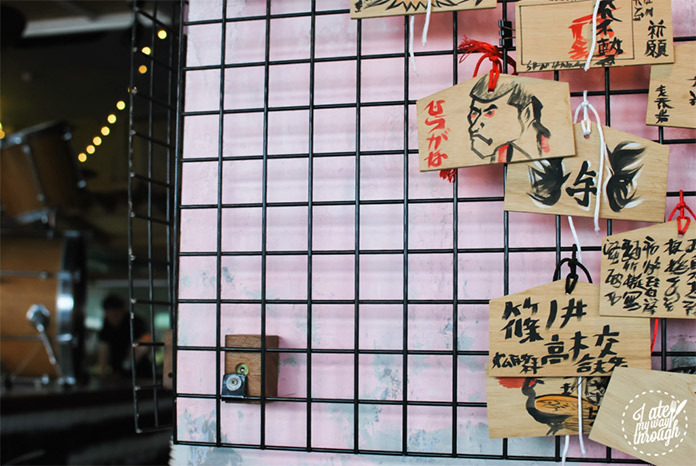 The first time I took notice of Daniel San was at the recent Good Food Month Night Noodle Market – their stall lured us with the amazing smell of yakitori skewers being grilled over charcoal. Some weeks later, I’ve finally trekked over the Harbour Bridge to Daniel San at Manly Beach! It was a warm muggy day so cold icy refreshing drinks were definitely in order. The Green Lantern was a mixture of Midori, a dash of yuzu liquour, Calpis and freshly smashed mint. 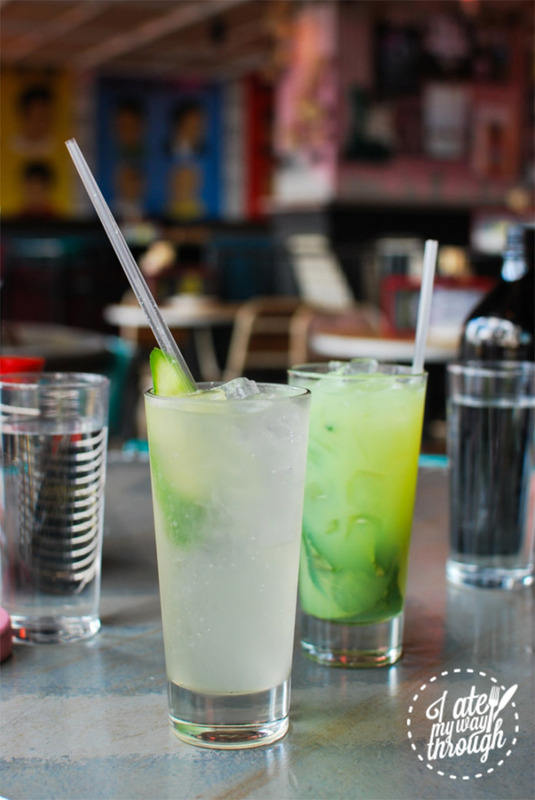 The mocktail version of the Miyagi Mule was fizzy ginger beer, fresh lime juice and for added freshness, a slice of cucumber. 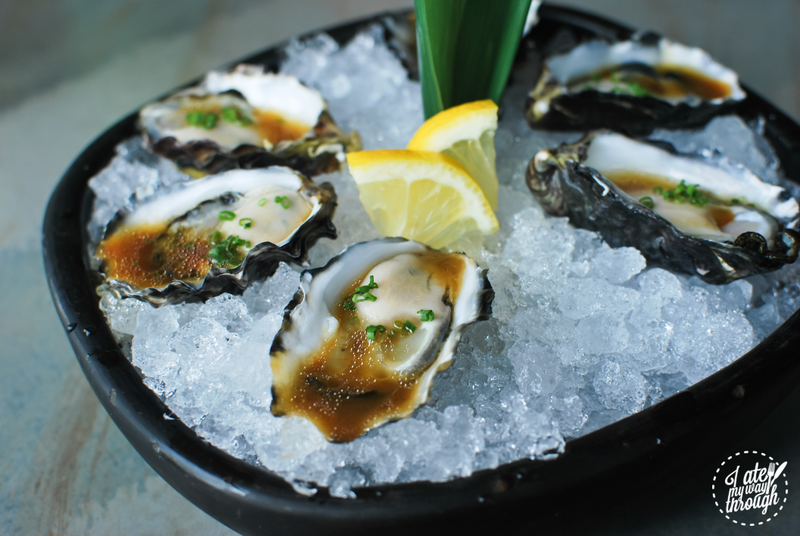 To start off the meal, we couldn’t go wrong with Fresh Oysters ($21, Half Dozen) with Yuzu Vinaigrette. The oysters were very plump and fresh and the vinaigrette simply brought the dish to life. 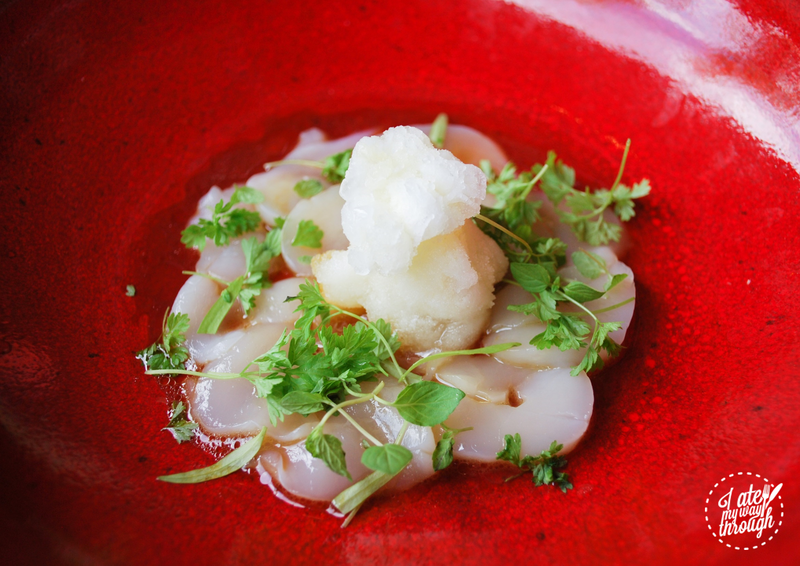 The Scallop Sashimi with Japanese Citrus Snow ($16) arrived in a striking red dish. The icy cold Japanese citrus (yuzu) snow worked well with the silky scallop sashimi, and the aromatic micro herbs gave the dish a vibrant lift. This was hands down our favourite dish of the night. 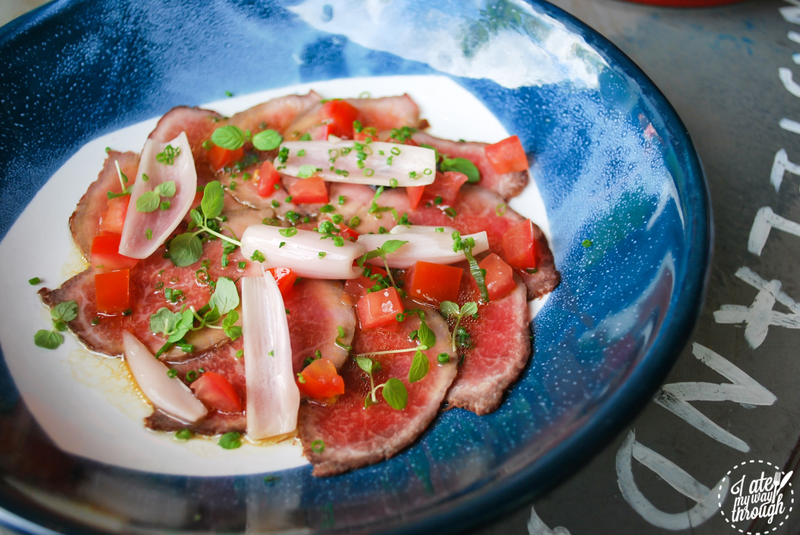 Seared Beef Carpaccio with Japanese Lime & Soy Dressing ($15), this combination of lightly seared beef tataki and ponzu dressing (lime & soy) is a classic that always works. The lightly pickled onion was a welcomed addition to the dish as it added a tangy depth. 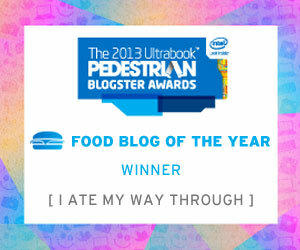 The beef was tender and seared perfectly – still pink in the middle. 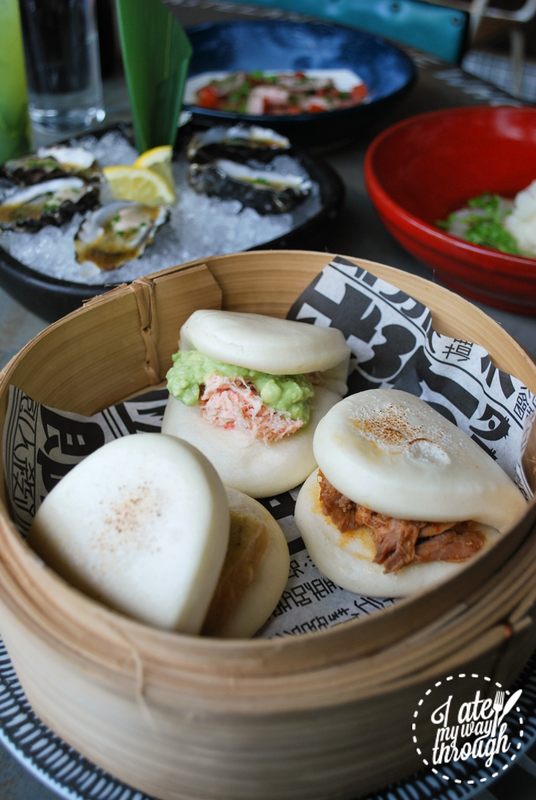 We were lucky that our visit coincided with “Monday Bunday” – where you can order just a single Steamed Bun with your choice of filling for just $3 each (usually sold as a basket of three buns). 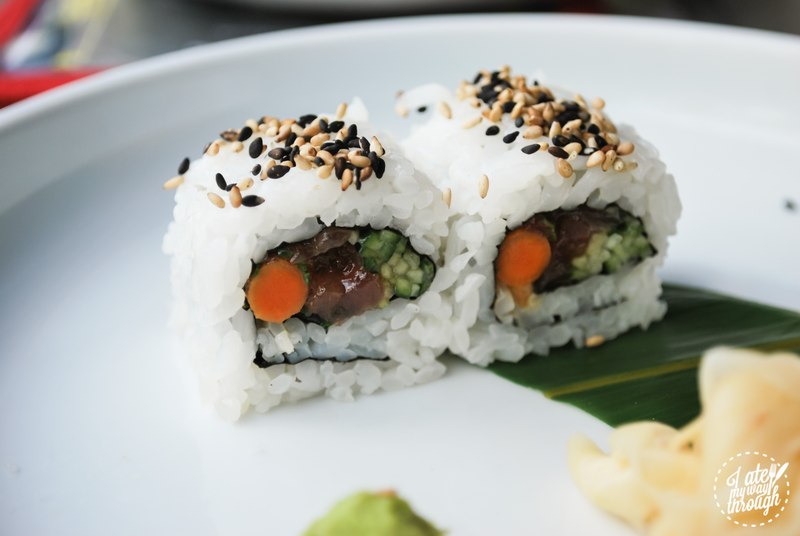 This meant we were able to try all the 3 different fillings on offer without the risk of bun overloading! The fillings were Veggie (spicy tofu, grilled avocado guacamole), Porkie (pulled pork, spicy cashew sauce), Californication (snow crab, avocado). For something more substantial, we ordered 220g Chicken Karaage ($14.50). The karaage was served more like katsu style (sliced crumbed piece) instead of the individual bite sized we usually expect of karaage. 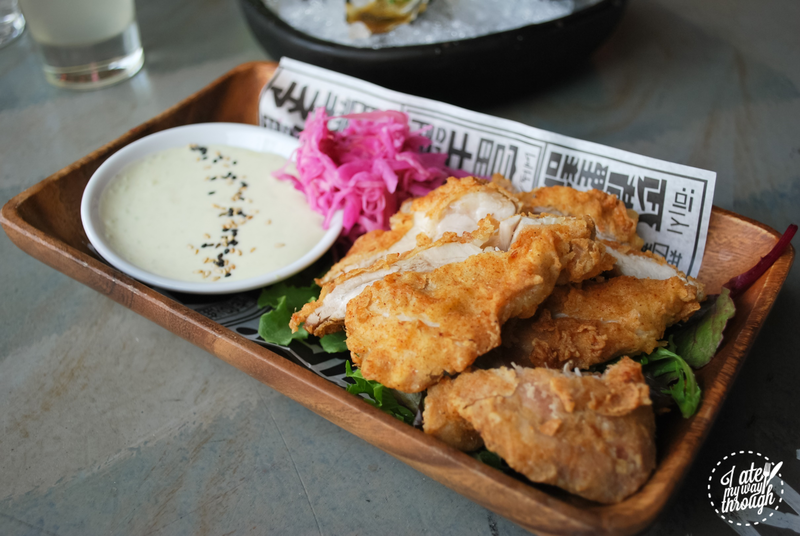 The wasabi mayo was delicious and the pickled cabbage helps to cut the richness of the fried chicken. Conveniently located a few steps away from Manly Beach on the ground level of Novotel Manly, Daniel San is the perfect hang-out after a day at the beach. 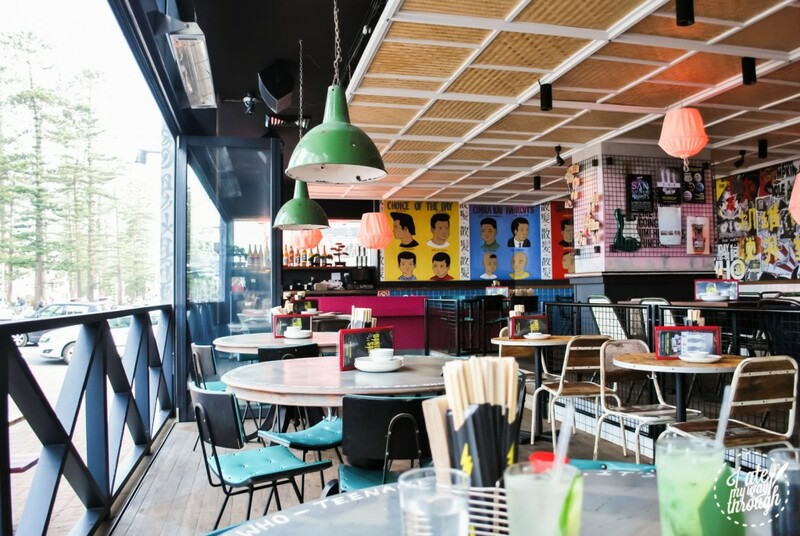 Do not let the bar atmosphere deter you from bringing in little ones here as they are child friendly and even have a special Kids Menu for the young ones. The dishes here are fusion Japanese and although there are quite substantial items on the menu, most of the items would be perfect bites to accompany drinks. I Ate My Way Through dined as guests of Daniel San. Monica's passion for food started at a young age - mixing various sauces into leftover drinks whenever she dined out - her family can definitely vouch for that. Which is no surprise that she then took on Food Technology for her study and has worked in a food ingredient company for the past 13 years. Monica loves taking photos of foods which then progressed to having her own food blog (currently inactive but she is planning to revive it again). She would try anything once, but her favourite type of foods are definitely Japanese and desserts.